Lois Creech Ray, 100, passed Monday, April 8, 2019 at Glenvue Health and Rehabilitation. She was born July 19, 1918 to Joe Q. and Lucy Hutto Creech and lived in Glennville most of her life. 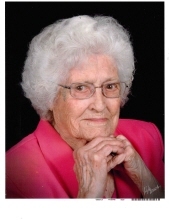 She was a homemaker, a farmer’s wife and long time member of Watermelon Creek Baptist Church. She is preceded in death by her husband, Calvin Ray and daughter, Janice Ray Knight. Three Grandchildren, Alan (Kim) Knight, Lynn (Clifton) Reed, Bobby Ray, several Great Grandchildren, nieces and nephews also survive. Visitation will begin at 2:00 pm, Wednesday, April 10, 2019 at Watermelon Creek Baptist Church. Funeral Services will follow at 3:00 pm, at Watermelon Creek Baptist Church with Rev. Steve Miller officiating. Burial will be in Watermelon Creek Church Cemetery. Pallbearers: David Cammack, Danny Ray, Gary Ray, Dennis Moore, Paul Dutton, Tommy Ray, Joe Catanzariti. To send flowers or a remembrance gift to the family of Lois Creech Ray, please visit our Tribute Store. "Email Address" would like to share the life celebration of Lois Creech Ray. Click on the "link" to go to share a favorite memory or leave a condolence message for the family.